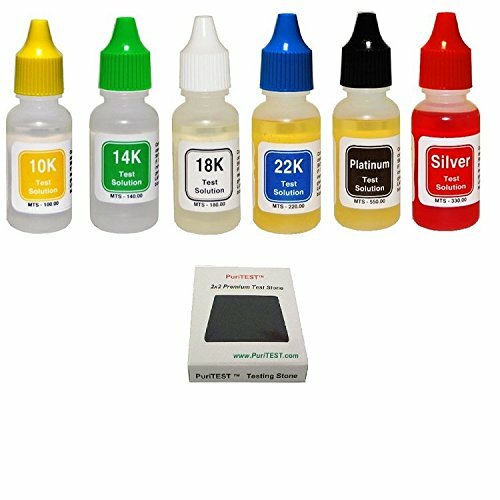 10K, 14K, 18K, 22K Gold and Silver Test Acid Kit Tools 5 Bottles of Testing Acid. Each bottle contains 1/2 fl oz of acid. Sturdy plastic bottles maximize safety and allow the user to easily squeeze out one drop at a time. You receive: One bottle of 10 karat gold testing acid. One bottle of 14 karat gold testing acid. One bottle of 18 karat gold testing acid. One bottle of 22 karat gold testing acid. One bottle of silver testing acid. Due to testing acid being classified as a hazardous material it cannot be shipped by air and can only be shipped to the lower 48 states. Also includes an economy Test Stone. This is a new acid testing stone. This stone is for testing 10K, 14K, 18K, 22K and silver. Use this stone with acid solutions. It measures approximately 1 7/8" x 1 7/8" x 1/4" (48 x 48 x 6 mm). Due to the hazardous material that the acid is these solutions can not be returned or refunded. 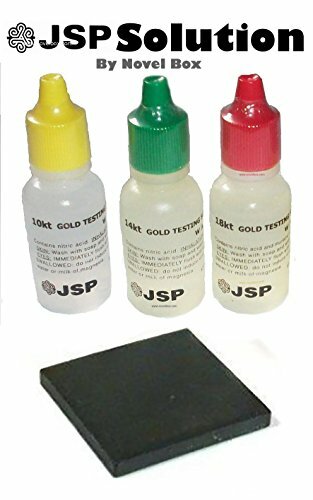 7 Piece Gold Testing Acid Jewelry Test Kit w/ Scratch Stone 10k, 14k ,18k ,22K, Platinum, Silver, and Scratch Testing Stone Fresh from the Factory This Comes with a large testing stone 2" x 1.5" Each bottle has 1/2 fl oz of acid. The sturdy plastic bottles maximize safety and allow the user to easily squeeze out one drop at a time. All bottles have different cap colors to help keep acid karats organized easier Latex Gloves are recommended with the use of any testing acids for safety You will receive: 1 bottle of 10k testing acid 1 bottle of 14k testing acid 1 bottle of 18k testing acid 1 bottle of silver testing solution 1 bottle of platinum testing solution 1 bottle of 22k testing solution 1 Scratch Testing Stone 2" x 1.5"
As a factory authorized seller of genuine JSP acids, we can guarantee our stock is always fresh. 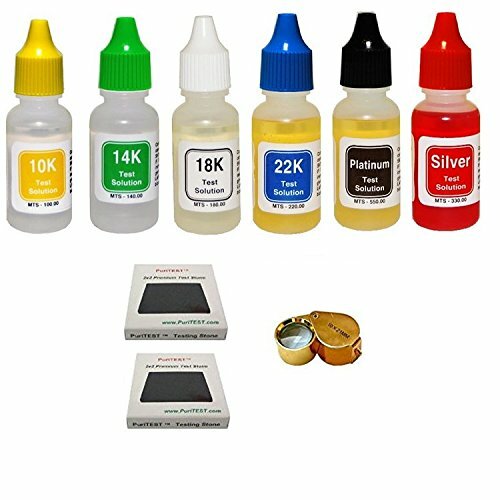 This kit includes one 12g bottle of 10k, 14k, 18k, and 22k gold, as well as silver and platinum. 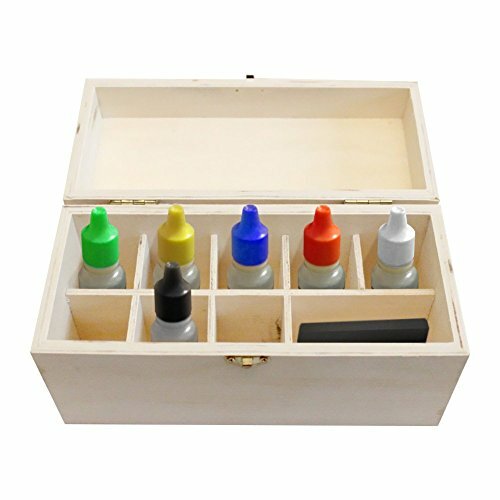 This kit also comes with an Economy Test Stone that measures 1.5" x 2"
All solutions are ordered fresh and shipped fresh. 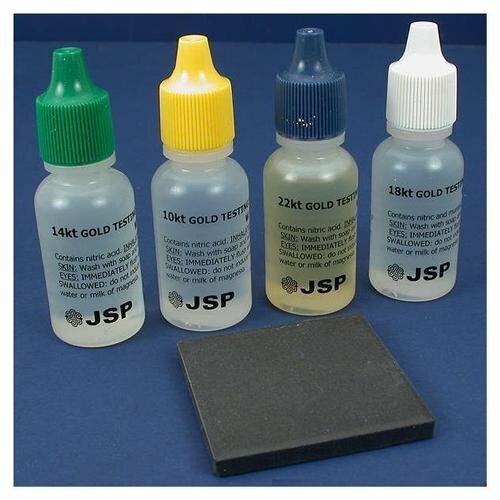 The process is simple: scratch or rub your gold sample (e.g., jewelry, coin) onto the testing stone. A soft scratch will leave a sample residue you can test. --Apply a small drop of the acid purity you estimate your sample to be onto your sample reside. --If the acid dissolves the metal it's less then the karats on the bottle and you should try again with lower level acid. If it dissolves the metal slowly, it's possible your sample is slightly less pure than was suspected. If the sample reside remains unaltered, it is consistent with the purity of the test acid you used. 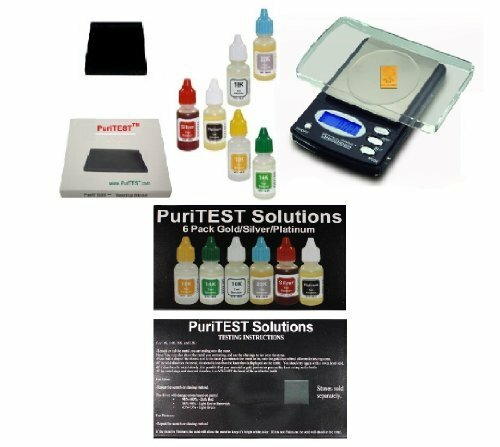 How to use a gold test kit 10k 14k 18k 22k 24k/ HD shown how! 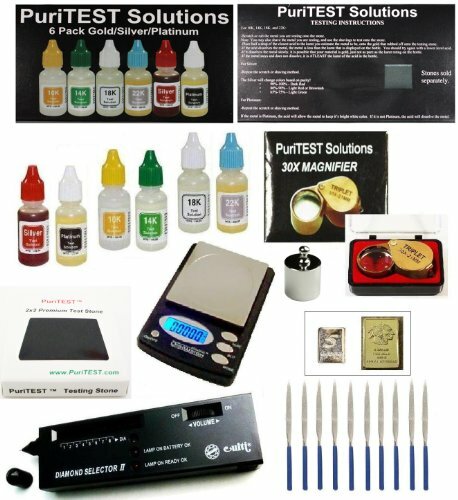 Simple description on how to use a gold test kit. We here at America's Trusted Gold Buyers teach you how to test your gold to determine the karate and see if it's real or fake. 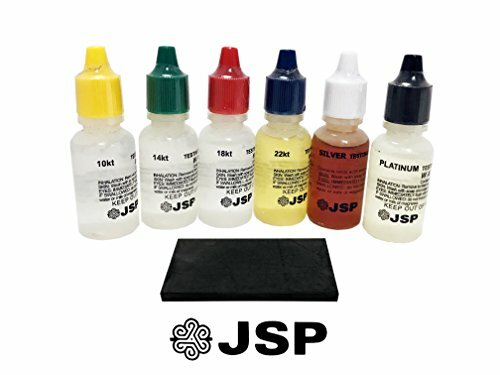 Compare prices on Gold Test Kit at ShoppinGent.com – use promo codes and coupons for best offers and deals. Start smart buying with ShoppinGent.com right now and choose your golden price on every purchase.